With more than 750 million passengers taking to the skies in the United States each year, it is no surprise that illnesses passed from traveler to traveler are on the rise. Because many flights are full or even overbooked, passengers have little choice but to rub elbows with their seatmates, increasing the risk of transmitting bacteria or viruses responsible for many uncomfortable diseases. At the same time, airlines strive to keep planes as sanitary as possible. The air supply in passenger cabins is highly filtered with advanced HEPA filters before being diluted and recirculated, keeping any airborne contagion to a minimum. Furthermore, if an obviously ill passenger attempts to board an aircraft, the flight crew has the authority to deny them access. Each plane is cleaned between flights, though the exact sanitation measures vary depending on the airline, type of aircraft, length of previous flight, and other factors. In general, passengers on board an aircraft are no more likely to contract viruses from their fellow passengers than individuals sharing a crowded elevator, riding on the same public bus, or working together in the same cubicle-maze office. Because many airline flights lead to important events such as vacations, business meetings, weddings, and other special occasions, taking extra precautions to prevent contracting a virus while flying is a wise thing for every passenger to do. Staying healthy while flying begins long before checking a boarding pass or submitting to security screenings. The type of reservations passengers make can limit their exposure to airplane virus safety risks. 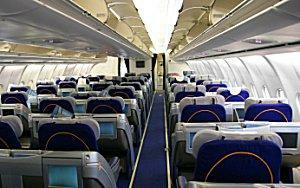 Choose larger aircraft that is more likely to have empty seats to add buffers between passengers. Opt for business or first class seats if possible for more personal space. Choose to fly during non-peak times and along non-peak routes to increase the chances of a partially empty flight and less-crowded airport. Sit in the rear of the aircraft to reduce the number of passengers who must pass your seat. Choose a window seat if possible to minimize contact with passing travelers or seatmates. Take a regular multivitamin and opt for extra Vitamin C if possible. Eat a healthy diet with plenty of fruits and vegetables and only limited junk foods. Get enough sleep, especially right before the flight to rest the body well and increase its defenses. Exercise regularly to help strengthen the body's immune system. Do not travel if you are ill or if you may be getting sick. Not only is your immune system weaker at that point, but you also risk spreading the disease to other passengers. Practice relaxation techniques that can reduce stress; stress lowers the body's resistance to illness. If you will be traveling during cold and flu season, get a flu shot before flying. The biggest risk of contracting a virus while flying comes from direct physical contact with infected surfaces. To avoid this risk of virus contagion, follow these tips. Use the restrooms in the airport immediately before boarding and wash your hands thoroughly with hot soap and water. Use a sleeve, tissue, or handkerchief as protection when opening the overhead compartment to avoid direct physical contact. If possible, store carry on items beneath the seat in front of you and avoid using the overhead compartment at all. Carry antibacterial, disinfectant wipes to use on seatbelt buckles, armrests, tray table surfaces, window screens, and other potentially infected surfaces. Carry antibacterial gels and foams to keep your hands clean after touching questionable surfaces. Use your own pillows or blankets rather than requesting them from the flight attendants. Stay hydrated by drinking water, tea, or juice to keep nose and throat membranes moist so they can more effectively screen out viruses and bacteria. Avoid soda and coffee, both of which actually dehydrate membranes. Follow food safety precautions if eating meals onboard the aircraft; foods should be the appropriate temperature when served. If you brought food on board the aircraft from the airport, be sure it is the proper temperature before eating. When the plane lands, stay seated if possible and avoid the rush of bodies exiting the aircraft. Avoid excess contact with seat backs, overhead compartment handles, and other surfaces that have been repeatedly touched by hundreds of passengers. When picking up checked baggage, wipe handles carefully with an antibacterial wipe to ensure they are clean. Simple cleanliness precautions and airplane virus safety tips can help travelers avoid contracting illnesses while flying, which will in turn let them enjoy their destination in good health.